The living room is a place to enjoy video games, TV, movies, as well as time with family and friends. Whatever you’re doing , however, the chances are, you’re sitting down. 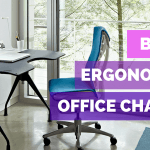 As such, having ergonomically correct living room chairs that adjust to the various activities you do while supporting your body is important. 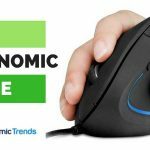 In this guide we review the top 5 best ergonomic chairs you should get for your living room, from recliners, sofas, to lounge chairs. Lets begin! This living room lounge chair is equipped with a range of massage features and soft materials. As a result, you can experience incredible relaxation, especially if you utilize the Ottoman and recliner settings. 5 preset massage settings plus 9 intensity levels: There is a total of five pre-programmed massage settings available to use (which can be used without the Ottoman connected). Within these massage types, there are nine intensity levels and two modes that can knead your calves, lower/upper back, and thighs. Moreover, there is a heating function that can be activated separately from the massage on cold days. The wireless controller that controls these functions is easy to use, without wires to get in the way. Soft armrests, seat, and double padded backrest: The armrests and seat are made with the soft cushioning material. The backrest has also been double-padded to ensure you can relax in complete comfort. You can lay back in the soft padded cushions and enjoy falling asleep in front of the TV. Decent weight capacity to support most people: The chair is 27×29 x 41” large and has a maximum weight limit of 250 lbs. The Ottoman is 20x16x16” in size with a weight capacity limit of 200lbs. So, both the lounge chair and the Ottoman can support most people comfortably. Built with durability: Since the frame used to construct this chair is metal, you can feel confident in knowing that it’s incredibly sturdy. The electrical wire that connects the Ottoman and the seat can be easy to trip over. This is especially the case when you’re getting up from being seated. You often have to lift your leg up fairly high to step over it. Therefore, it may not be the best choice for elderly people. Bottom line: Ultra modern, executive style ergonomic sofa equipped with a host of high tech and reading features. Those of you looking for a 21st century modern couch with great ergonomic features such as scooped seats, neck pillows and comfortable armrests will want to take a closer look at the Coaster Home power sofa. Scoop seats and very modern design: The scoop-style seats huge the sides of your body while keeping you firmly nestled in as you watch a movie or read the papers. The individual armrests are thickly padded, and makes you feel like you`re in the luxury box of a movie theater.. This will probably be one of the most comfortable couches you`ll sit on. Neck support & flat sofa feature: The sofa chair comes with a neck support built-in to the seat. I also liked how you can turn it into a couch that’s completely flat. You can comfortably lay on it too, without feeling any bumps. Electric powered recline: Unlike some of the other chairs reviewed here, the Coaster Home Furnishings sofa comes with power recline and headrest adjustment to make it easy to change the posture of the chair to your liking and at a whim. Note that the center seat does not recline, only the two on either ends. Pull up storage: The sofa’s armrests open up to let you store newspapers, magazines, and other things you want to keep within arms reach similar to the storage compartment in a car. Convenient cup holders, LED lights, and no more messy wires: Some of the main gadgets and accessories include cup holders, LED lights, USB charging ports, and a wire management system. No, this definitely isn’t your grandpa’s sofa. The cup holders mean you can easily store drinks nearby you safely. There are no more spillages on the floor as a result of putting cups on the ground. I love the LED lights, which is a cool feature that can be used for reading or just finding your remote when watching a movie . The USB charging ports make it easy to keep your phone or tablet fully charged at all times while you socialize or watch TV. And finally, I appreciate the wire management system that keeps the living room clutter free from excessive wires. The supposed leather material used for this chair isn’t real – it’s artificial. As a result, it may be prone to cracks after a year or so if it’s not taken care of. Some customers have also had trouble using the complicated instruction manual. So, assembling parts of the chair can be a pain. Cup holders and large storage compartments. 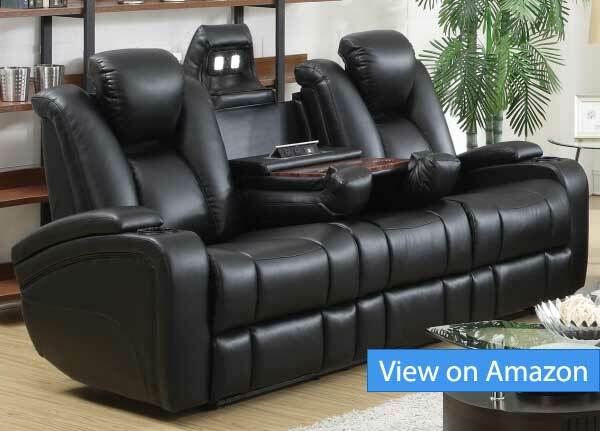 This is one of the most striking reclining chairs you can put in your living room. It features top grain leather finishing with ergonomic lines that contour to the shape of your body perfectly. Effortlessly interact with people around you with the swivel feature (which is fun to use purely for your own entertainment too!). With an ottoman, reclining feature, and memory foam, you can relax in complete comfort. Simple lever for easy reclining: An easy-to-use lever enables you to enjoy this chair in a reclined position. We also liked how it comes with a swivel feature too. This lets you effortlessly turn to different directions to grab the remote or interact with people around you. Memory foam & lumbar support: With a lumbar support system, you can feel completely relaxed and comfortable while sitting in this recliner. Moreover, the Oslo Recliner comes with an ottoman that has been purposefully angled. This lets you put your feet up and experience complete relaxation after a long day at work. They’ve even gone as far as to add memory foam into this recliner. 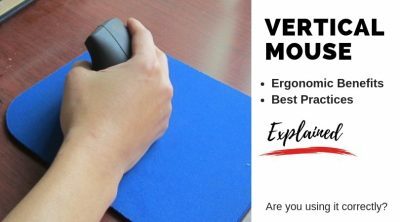 It contours to your body to provide you with incredible ergonomic support. Fantastic design & colors: The approach to the design of this chair is sleek and minimalist. It looks fantastic in all living rooms. It’s also available in different colors (Merlot & Cobblestone) to suit your room best. The leather material over the top looks excellent and adds a sense of class to the chair. Some people have noticed the leather layer over the top of the recliner can become easily damaged over time. It’s also pricey compared to the other recliners and sofas featured in this review. Lumbar backrest for ergonomic back support. 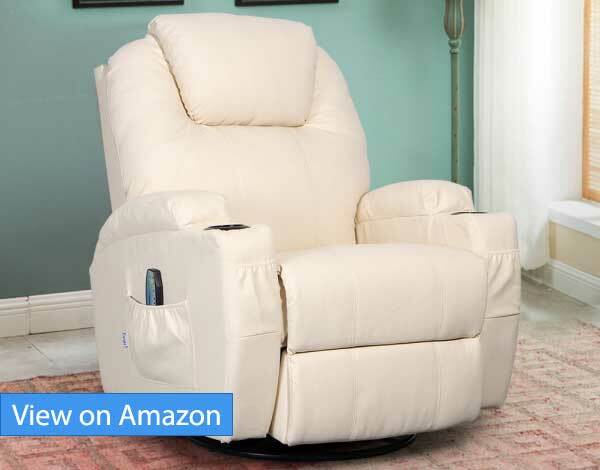 Bottom line: Ultra plush PU leather recliner with massage and heat functions. 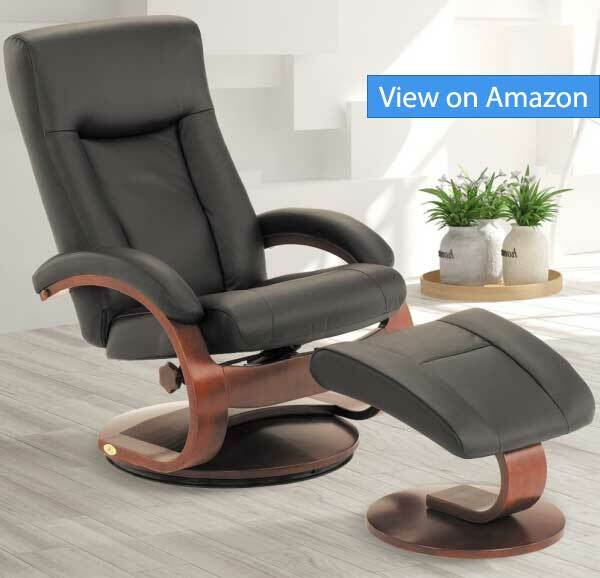 This Esright Massage Recliner is one of the few lounge chairs that combine heating and massaging into an affordable pacakge. The PU leather that comes in a choice of 6 colors looks luxurious, and is very comfortable to sit on. Swivel 360-degrees and recline in comfort effortlessly: You can recline back in this chair up to 150-degrees with minimal effort. Furthermore, you can rock and swivel 360-degrees too. If you have friends over, the swivel action on this lounge chair is perfect for interacting with people around you in your living room. 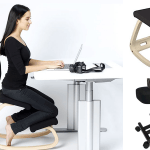 The chair also rocks, which is great if you’re feeling restless or looking for a little movement in your chair. 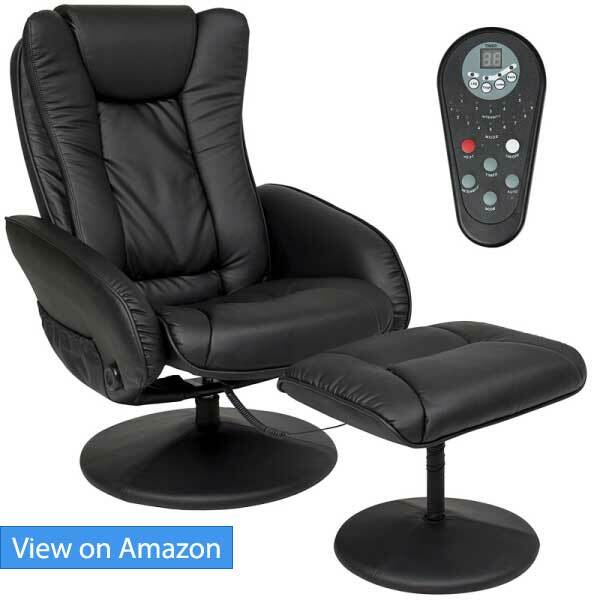 Massage and heating functions: The massage mechanism runs across the entire lounge chair, from backrest, seat, to the leg areas to give your body added relaxation after a long day’s work. The heating function meanwhile is only found in the lumbar area. Note that the massage feature on the Esright Massage Lounge Chair is rather basic. The best way to describe the sensation is a soothing vibration. It will by no means measure up to dedicated massage chairs, but it’s a nice addition nonetheless. Built-in cup holders and storage: Two drink holders are built-in to this chair. 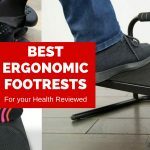 Often times, people put them on the floor next to their feet, and spillages occur way more than they should. Combined with 4 storage pockets, and taking a sip of the cold one or reading the newspaper is just an arms length away. All of the lounge chair’s adjustment features, such as recline and returning the footrest to its upright position is done manually. If you’re a senior, performing these position changes may be difficult for you. Also, the massage feature is just mediocre. 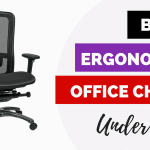 Reclines up to 150 degrees backwards for total comfort. Manual recline and return to upright position may be too taxing for some people to perform. Bottom line: Compact reclining chair that’s easy to maintain and with a small footprint for small spaces. 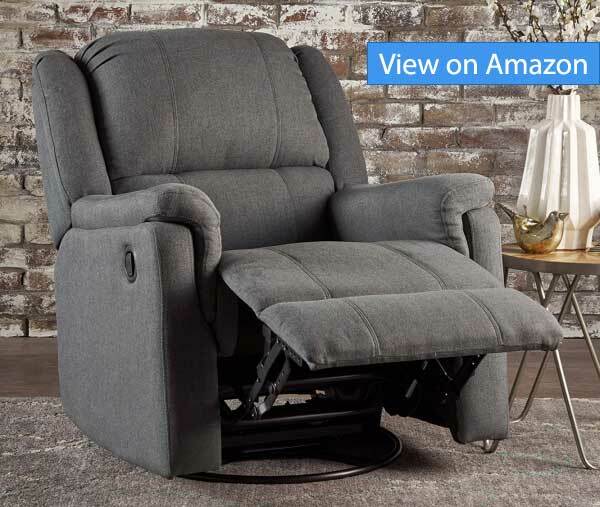 If you’re looking for a reclining chair that comes with a variety of adjustment features, you’ll appreciate how this one can recline, rock, and even swivel. It’s also a very compact option for smaller spaces. 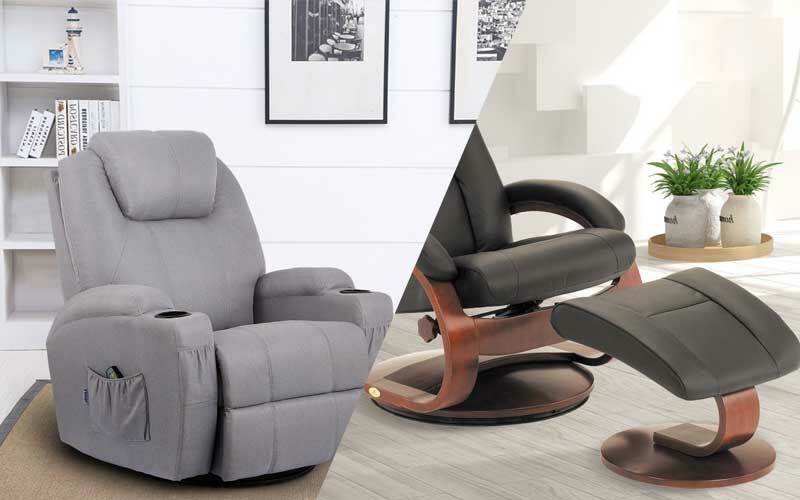 Recline, swivel, and rock in complete comfort: The Jemma recliner chair does it all when it comes to movements. It can recline all the way back for a nice nap, swivels to easily interact with different people in the room or reach for items in your surroundings, and rocks for a nice hypnotic motion. Super soft polyester materials for added comfort: To add to the comforting experience, the fabrics used to make this chair are completely polyester. It’s easy to maintain, stylish, and comfortable. Perfect size for smaller spaces: This Jemma Recliner is 37x 30.71x 38.58” in size. It’s ideal for small spaces. A glaring concern surrounding this chair is that operating the recliner settings can be challenging. Putting it into the reclined position is a breeze. However, when you want to set the chair up back to normal, there’s no lever available. Therefore, you have to use your hands or feet to physically push it back into position. People who have weaker legs would struggle to push the recliner back in. When considering the best chairs for your living room, look for recliners, sofas, and lounge chairs that are both ergonomic and comfortable at the same time. An ergonomic living room chair should feature lots of adjustments to suit the many different people that will be sitting on it. Of particular importance is the ability to recline, with your back and neck supported as you watch TV or movies. Ottomans and footrests are also important to properly support your legs. 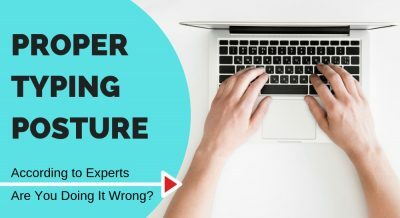 Comfort is rather subjective, but in general, pick chairs with generous cushioning and padding, as you’re often be laying down or seated for a prolonged period of time in the living room. If you’re in a hot climate zone, consider cotton or polyester finishing instead of leather for more breathability.